The SR-71 is an advanced two crew, two engine, delta winged, high altitude, long-range, supersonic strategic reconnaissance military aircraft produced by Lockheed, Skunk Works division, since the mid 1960's. It was originally developed as a "black project" from the Lockheed A-12 reconnaissance aircraft and the idea was that the aircraft should be capable of flying outside the reach of surface-to-air missiles and also be capable of outracing them. A total of 32 aircraft was built and they served with the U.S. Air Force from 1964 to 1998. In all those years none were lost to enemy actions and since 1976 the SR-71 has held the world record for the fastest air-breathing manned aircraft. The nickname is Blackbird but is also known as Habu. I purchased this add-on aircraft directly at FS Pilot Shop and the purchase and download went without any issues. The internet connection to the download server was excellent so the file was downloaded in no time even though the Blackbird file is about 100 MB. Installing the aircraft was very easy, just activate the included installation wizard and the complete installation is done automatically - you don't even have to write in a registration code or similar since this add-on does not feature that. It's a good review, but please, in the future, don't leave menu bars up or green info texts across the top of the screen. It ruins beautiful screen shots. Although there is a difference in operation and appearance between the SR's INS vs modern GPS, in practice, the results of using them is the same- high resolution navigation maps. The spin problem was likely a result of stalling. The uncontrollable pitch trying to exit the stall was likely caused by leaving the ALT hold on and HDG or NAV hold on. You cannot exit a stall spin while trying to hold an altitude and bearing. You have to let the plane dive to gain speed and straighten out to stop the loss from turning continuously. Hi all - thanks for your feedback. It is correct that the spin was due to a stall, however when that happened I was flying on manual = autopilot OFF. In my real life flight experience I am educated within aerobatics, so spins I am quite familiar with.... what seemed strange to me was that I could actually gain altitude during a spin which I have never seen in real life. Other than that I really liked the aircraft a lot - I like flying military jets and "black" project aircrafts so this one was certainly a must try for me. Actually I have also tried out two other SR-71s (the original Virtavia and ProfiSoft) but I think the Glowingheat is the very best. You can gain altitude momentarily in a stall when the attitude of the aircraft pitches up as a result of the lift gained by a previous dive. However, I would speculate there may be a fault in the modeling. A delta wing aircraft will not behave this way. Once lift has fallen below what is required to sustain the aircraft, the plane will sink like it's falling down an elevator shaft even though it is level or pointed upward. This is how my freeware SR-71 behaves. 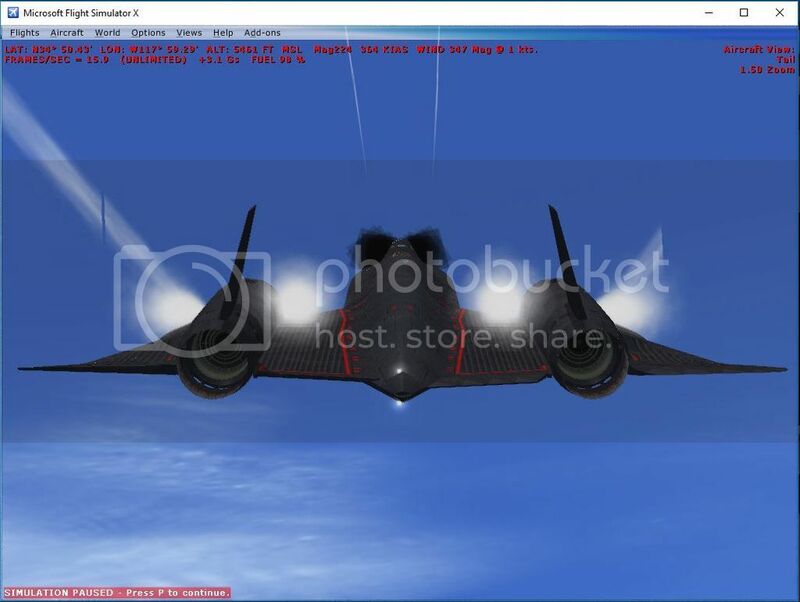 Note: the SR-71 does not fly like an airliner, setting a mach speed for climb or cruise. Rather, it flies very specific airspeeds. In the climb, you use one of two climb speeds: 400 EAS or 450 EAS depending on the mission. At cruise, you use the airspeed which keeps the instruments on specification based on the altitude and weather. There is no mach speed setting in the SR-71 that just "works." - Next, I renamed the "fx_1.bmp - Copy" effects texture as "fx_Aa-Con.bmp"